Kedaar is becoming very active day by day.For the last 3,4 days he is trying out some new things. He tries to balance himself on his knees instead of stomach for a little while. He is doing some attempts to sit by using his hands as support. One of his favorite activities is putting his toes into the mouth. He moves very fast on his stomach and some times by using his head as support. We went to see the Tulips last sunday. The season is between April 1 - 30 this year. Though we went at almost nearing the end of the season, the fields were still wonderful with several colors. Kedaar had lot of fun looking at the brightness around him.We also had few Tulips at our home. These are grown from bulbs we had put last year. Albumn below has some of our photos with Tulips. The albumn below has few photos from our recent India trip. We came back from our India trip on the evening of March 31st. Our return journey was in Malaysian Airlines through the route Hyd -> Koulalampur -> Los Angeles -> Seattle. get bassinet for all the flights in our return trip.This made the journey little easier as Kedaar could get atleat few hours of undisturbed sleep. One thing I must mention about this trip is the airport hotel we stayed in Singapore while traveling to Hyderbad. The hotel was excellent and really made our hectic trip little better. India trip was fun overall though it felt like a very short one. Everybody were so excited to see this little, ever smiling baby. 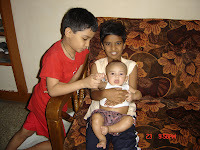 Pavan, Padmasri and my brother's son Rutwik, sister's son Sunny played with Kedaar a lot and had lot of fun. in Hyderabad. Generally "Annaprasana" is done in 6th month for boys and is done by mother's brother. We wanted to do it atleast informally for Kedaar when were in India though he is in his 5th month as my brother would be there. Both functions went on smoothly and lot of relatives joined us for the functions. We had to buy some cotton summer clothes for him and he appeared like a totally different boy in those clothes. We bought some traditional dresses for him in India that he could wear once he starts walking.3 weeks just flew by, we felt very sad to come back to Seattle all alone.Grand parents from both sides were also very sad to leave Kedaar. It was a gloomy time, and we keep missing everyone even after 1 week after coming from India. We joined Kedaar in a home day care in Issaquah from Monday , April 2nd onwards. THe day care story is an interesting one. Chandra changed his job to myspace.com before we left for India. His office is in Seattle downtown now. So the original day care (Brown Bear educare) we planned in Bellevue was not a very convenient one for dropping Kedaar and picking him up. However we decided to keep him there for a month because we paid 1 month advance. were not getting one teacher they were expecting to return. It was a shock. Our plan was to join him there from monday and go to our jobs.We did not have any sleep that night. Next day early morning I called one home day care lady Kathy that I got recommendation from my Expedia colleagues. She was absolutely nice and agreed to keep Kedaar immediately . She has 4 kids in the day care, 2 of them are > 2yrs age and one girl (Mirinda) is just 2 weeks older them Kedaar. Kedaar has done well in his 1st week of day care. He still has jet lag, sleeps all the day and is wake up all the night. We are trying to get him to routine this weekend.